Want to learn how to grill a turkey? Mere amateurs who jump into it too fast can have catastrophes if they try grilling turkey! The size of these birds makes them a bit different than your typical grilled bird. I mean think about it, even oven cooked turkey for Thanksgiving often turns out rather bland and dried out. Sure, those juicy thighs might be fine but the thick breast meat is like a barren desert. So if you just throw a whole turkey on the grill without learning how to grill a turkey properly you are bound to run into similar problems. Another issue is their sheer size. Turkey's are large, starting at over 10 lb. and running up to well over 20 pounds. They take a long time to cook. So if you just throw them on a grill the outer two inches of skin and meat are going to be burn to a charcoalized mess long before the deepest parts of the breast and thigh are even done. So what's the solution? How to grill a turkey, a big ol' bird, without destroying it or drying it out? Well here are a few tips below, from the simple (but less fun) to the more involved. Cut it up! : This is an obvious solution to those giant birds getting burnt… simply cut it up into smaller pieces that will grill faster. While this is a simple solution, it doesn't do anything to add flavor or moisture to the bland breast meat. And who wants to serve a dismembered turkey on Thanksgiving with all your eagerly waiting family and friends waiting around. Somehow the impact is lost if you don't bring out a big, golden, whole turkey to display before carving tableside. So while this might be a fine solution how to grill a turkey on any other day (just check out my fun Grilled Turkey Leg Recipe), for a real festive occasion, read on. Use Indirect Heat: One 'must do' technique to employ when learning how to grill a turkey is to use indirect heat cooking on your grill. If you place your big bird over direct heat, it will be charred before the meat inside even begins to warm up. So the solution is to get a nice warm heat going in one part of your grill while keeping a section free to place the bird without any heat directly below it. Think stove baking, the heat source is somewhat removed from the food. You just want the hot air to circulate and heat your food indirectly. With a bird as big as a turkey this is best accomplished by pushing all your coals to one side of the grill and putting the turkey on the other side. A grill thermometer will help too. You can be sure the temperature in the grill stays where you want it with the lid closed. You want it somewhere around 350 to 400. Low and slow is the key to learning how to grill a turkey. 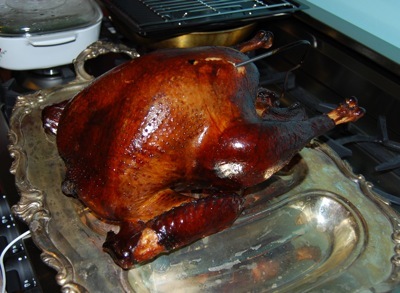 You'll have to add charcoal occasionally as a turkey can take from 2 hours to several depending on the size. I'd recommend a water or stock filled pan underneath the bird and consider adding smoking woods to slowly permeate your food with added flavor as it cooks. 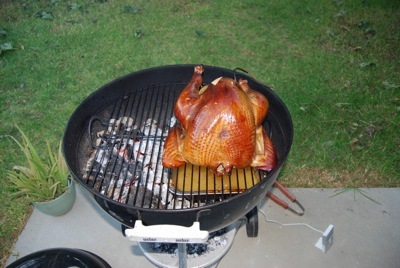 Apple wood, maple, pecan and other woods can all add interesting nuances to your grilled turkey. Use a Roasting Pan: Another way to isolate the turkey and help retain moisture is to cook it in a roasting pan, placed on the grill. This helps to further isolate the bird from the direct heat and allows you to fill the pan with a liquid (some combination of stock, seasonings and/or wine) that helps keep the bird moist during cooking. I definitely recommend this if you do not brine the turkey (see below) but can also be used along with it if you'd like. You can cover the turkey partially or completely with foil if you are paranoid about the outside burning but then you expose the meat to less of the savory wood smoke aromas. Brining: One of my strongest recommendations to consider, especially for very big birds, is to brine it before hand. A brine is a liquid mixture with a high salt content that the food is soaked in for a prolonged period of time before cooking. As the fluids in the bird and brine equilibrate, it draws in salt, seasonings and water into the flesh. This helps to flavor and season the meat (getting some delicious flavor into your bland breast meat!) but also helps it retain moisture so that when it roasts it doesn't dry out as easily. There are various brine recipes you can use, a couple examples are listed on my Grilled Turkey Leg Recipe and my other recipe for Grilling Turkey. Another example I use has a bold apple cider flavor that I find works best with pork products, such as in the Apple Cider-Brined Pork Tenderloin. If I had to give one tip for how to grill a turkey, ignoring everything else, I'd say that brining is the most important one. Even if you mess up at many other steps, this one thing can help save you and make even an amateur griller seem like a pro. Take Your Time: Did I mention turkey is big? They take a long time to cook! If you try to rush it you'll burn it or dry it out or both. Take it low and slow. Get a grill thermometer and use your vents to adjust the temp in your closed grill to keep it at a nice moderate heat, don't let it get too hot. If it gets too hot, close the vents on the top of your grill a bit. If you think your turkey is getting to much color too fast, you can always cover it a bit with foil towards the end of cooking. You'll need extra charcoal, add a bit every once and a while to keep the heat going. The good news about the long cooking time is that on a grill that gives you a great opportunity to use smoking woods and infuse tons of extra flavor. Choose a nice fruit or nut wood to bring some excitement to your big bird. A meat thermometer, particularly a remote sensor one, is a great way to check the temp inside your bird and determine when it is done. All or Some of the Above : You can use all the tips above alone or in combination with each other. For example, I routinely use at least brining and indirect heat every time. For some events and recipes I cut up the turkey. For some I use a roasting pan with basting liquid. However you do it, pay close attention to your bird and take it slow. Done with the How to Grill a Turkey page?